Is there an existing plug-in that provides shipping quotes for ad-hoc customers? I am looking for something that allows a new customer to build a card then enter postcode and country to get a shipping quote and therefore a total price before they commit to the effort of building an account and parting with their personal details. I think that's already part of CubeCart. I will need to double-check. In admin, Store Settings, Features tab, Misc section, "Disable initial shipping and tax estimates" is unchecked (although I have not verified this affects anything related to checking for actual shipping costs based on an entered zip code). That's amusing - it's the only field on that tab that isn't documented. Problem: Regardless of its value, and without a postcode selected, my anonymous user is getting a shipping quote that is offering a remarkably low price for delivery to anywhere in Australia (which seems to be selected by default automatically as the country in the address block.) There is no postcode information entered, so the postage module is making it up. I am running this particular query in a newly started Firefox browser. Firefox has never seen this installation before, so it is not using a previous login context. And without confirming the delivery country, it should not be quoting tax, in this case, since all prices are ex-tax. At this point in the dialog, the user has no idea that Australia is selected as the default because the address block is not yet displayed. The case below should show the cart items and the subtotal only, since it is purely about confirming the adjusted quantities. There is nowhere here to enter address information for the cart to derive tax and postage. Tax should only be displayed once the jurisdiction is known. Shipping costs should only be displayed once the postal code and country are both known. To add clarity, I disabled the Store Collection option and I now get $11.41 as the default selection in the list box. Bsmither - can you confirm this behaviour on one of your many installations? Preferably one of the few that has not been monkeyed with in this area. The completely correct solution is to put a note under Shipping "To see shipping options, select a country and region above and enter a postcode" and under the tax block "To see taxes, please select a country in the address block above." The postcode, region and country boxes should be enclosed in a box caption "Complete these for a shipping and tax quote". Problemette 2: The checkbox "Deliver to billing address" seems non-intuitive to me - it really should be "Deliver to another address" and not selected. I can hack it. But I wish I didn't have to." Apparently-already-solved-problem 3: Why don't we have a "Continue Shopping" button in the cart like my existing 4.3.4 store, and all other non-communist online stores have. I see there is an enhancement request and a forum thread on this already, but I cannot work out what eventually happened. Do I use the bsmither amendment to action it myself? After due reflection I am thinking that the neatest correct answer here is to have "View Basket" and "Checkout" do the same thing for anonymous users, which is take the punter to the nice, clean "View Basket" page, where added Country, Postcode fields are abetted and abutted by a "Quote Postage" button. The punter can choose to skip the quote and Checkout, or enter the postcode and country (which defaults appropriately) to get a quote. The first page of checkout has quite enough on it already so there is no need to make it busier. For account customers, we already have their details, so we can provide postage automatically. If the punter chooses to get a quote, the postcode and address information should be populated into the address fields of the next window. Incidentally, if the customer nominates a delivery address, I think it should start out defaulted to the billing address because often they are very similar - home address for billing, work address in the same town for delivery, for example. Post box for billing, house address in the same town for delivery. The names and contact details are generally the same. We all agree that better layout and phrasing is needed here. Maybe one day we will get it. CubeCart uses the store's own address as the destination address until the customer has provided, in some manner, a given destination address. Thus, the initial shipping charges are Estimated and, as observed, ridiculously low. CubeCart has hidden this problem when the store settings are to "Disable initial shipping & tax estimates". However, this hides the following feature. On the shipping line when viewing the basket, you see Estimated. By clicking on this word, a drop-down slides into view where the customer can enter a delivery location. CubeCart now has most of a given address and will get accurate shipping charges. This is your "Quote Postage". When the "Deliver to Billing" is checked, the Delivery Address collection of fields (should) disappear. We all agree that better layout and phrasing is needed here. Maybe one day. the included Foundation skin will have it. This will need some intervention. We definitely should not give an estimate until we know where the parcel is going. With my aforementioned Alice Springs example, the postage quote goes up by 3x when the postcode goes in. There are a bunch of potential customers who will find that very angryfying. That "Estimated" link is pretty subtle. I'm not a novice at this and I didn't guess it. It's an online store, not a gameified learning experience. On the other hand, once found it is very nice. Bouquets to the implementer, and a marshmallow brickbat to the interface designer. This is what I did. Disabled "Disable initial shipping & tax estimates". Then changed Checkout page to look like this. But now I get these warnings in my error log. Anything to worry about? When I did the disable initial shipping, it also removed the view basket option. How can we keep that option(view basket) and disable the initial shipping? This is only if the user is logged into their account. I don't think the two are connected. I just tested and this is what it shows when a logged in customer has added an item to their cart. I added the 'view basket" link myself awhile back. Click the words you go to the view your basket page. 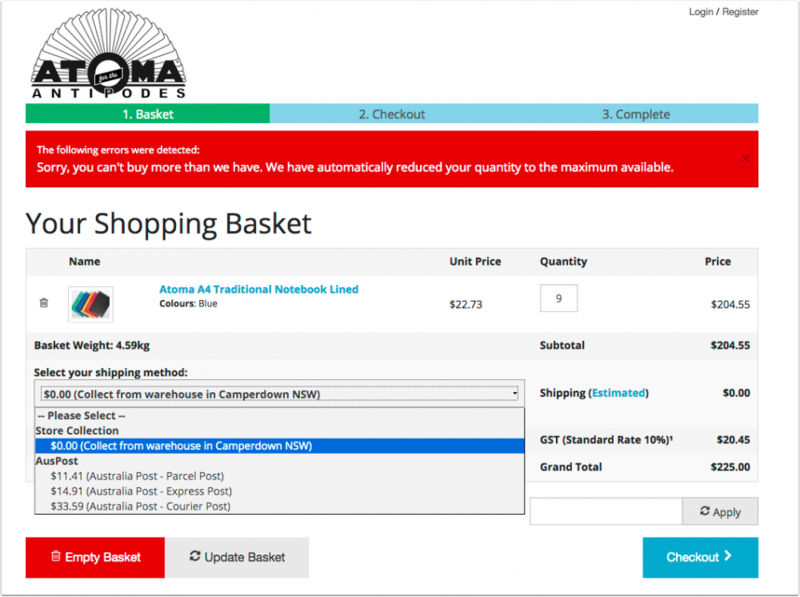 Click the dollar amount you get the mini basket with go to secure checkout.